Apsley, Furgason & the 11th form up a front on the battlefield. Jan Furgason comes to the battlefield for her fallen husband Terry as Grey's Chaplain Rev. Marvin Sweet offers comfort. Jan, portraying Jane Vawter, and Mike, portraying Capt. Draper, read from published 1861 Vernon Banner speeches. Kim and Marvin Sweet with grandson Bentley before the Ball. Jan and Connie show off their dresses on Sunday morning. Rick, Mike, Terry, Nancy, and Connie decide what to do next. Terry shows Connie the papers used to sign-up enlistees. 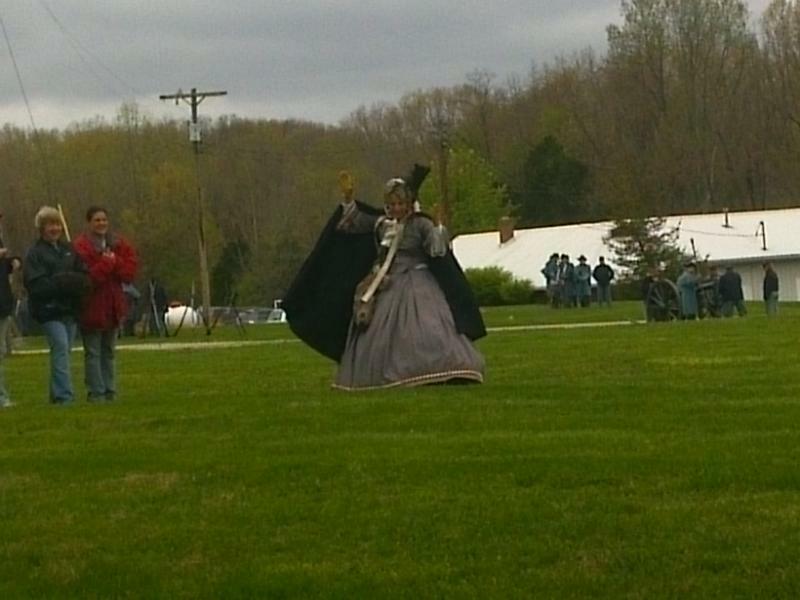 Jan demonstrates the skillet toss before the battle Saturday. Terry, Rick, and Mike (2nd, 3rd, 4th from R) & 11th ready for another battle. 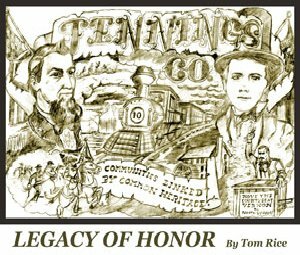 Rick relaxes near his the display of the history of Jennings County militia. Union camp (Greys tent fifth from left) Luke, Ed Noel (32nd IN) & Ed's grandson Tucker discuss the set-up. Mike, Tim Todd (7th KY) and Ed demonstrate and explain Civil War's weapons and camping. Mike and Ed revive the duel as Alan Weiss attempts to moderate action after Tucker takes a "hit" from the stray firing. Ed, Terry, Alan, Mike, Bob Jacobson (4th IN), Tucker, and Tim listen as a descendant reads over the new Civil War gravestone. The group fires three volleys to salute the fallen veteran and his descendants as Tim Todd (7th KY) prepares to play "Taps." Mike Ochs and TerryFurgason pose in camp before battle. Mike (L) joins dismounted cavalry as skirmishers. Mike enters the battlefield with other skirmishers. The crowd gathers for the coming battle. 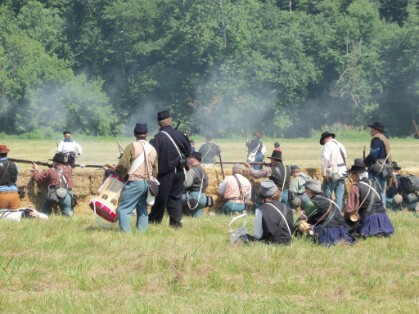 The Union soldiers maneuver on the battlefield. Justin Posey pulls guard duty after the battle. Cecil Copley opens the Memorial Day ceremonies. Barb King of the NV Plain Dealer with MUTC attendee. Vernon Greys present arms with the veterans honor guard. Rick tells the group about a gravesite for 9th IN Legion soldier. Lewis Wagner of Company D, 9th IN Legion in the Vernon Cemetery. Barb King interviews the Greys after the salute. Rick (R) & Nancy pose with friends. Union and Confederate reenactors camp on the South Lawn at Madison's Lanier Mansion. Rick Apsley, Gerald McGee, Justin Posey, Terry Furgason & Mike Ochs pose in front of Greys tents. Justin (R) and Rick (2nd R) prepare for battle with 6th IN. Mike (L) readies with the 4th IN Cavalry. 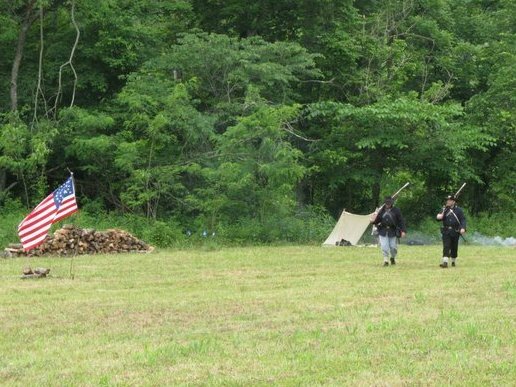 Justin (L) and Rick (2nd L) and the infantry advance on the left side of the battlefield. 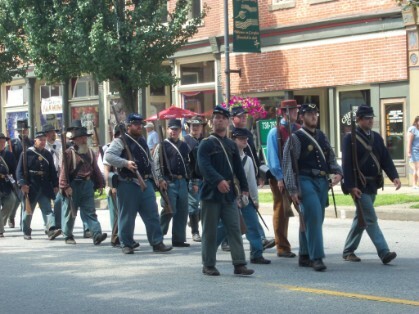 Mike (2nd L) and the 4th IN cavalry advance on the right toward the Confederate troops. The infantry and cavalry join forces. 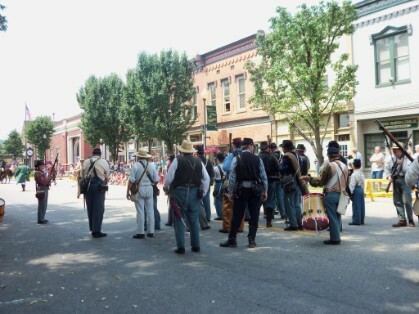 Union and Confederate forces talk to the crowd. 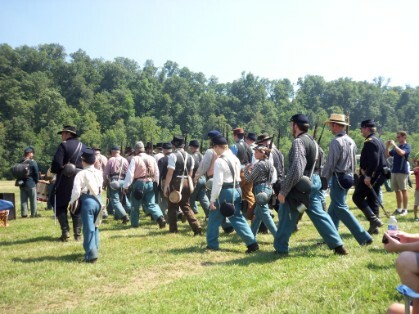 Militia men march to the second battle at the Battlefield Park. 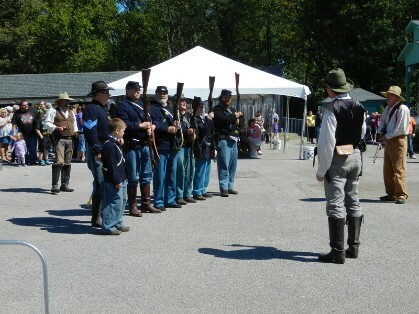 Union soldiers and civilians form a line to repel Morgan. 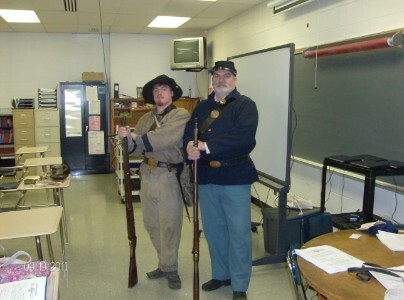 Hanover student teacher Jordan Stout (44th Tennessee) & Terry Furgason pose after a demonstration to a history class. 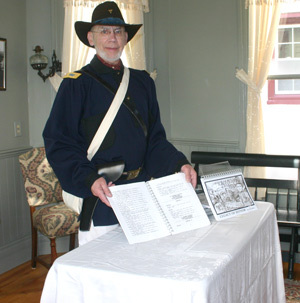 Stout and Furgason do another demonstaration for a history class with Furgason displaying 23rd Pennsylvania uniform. 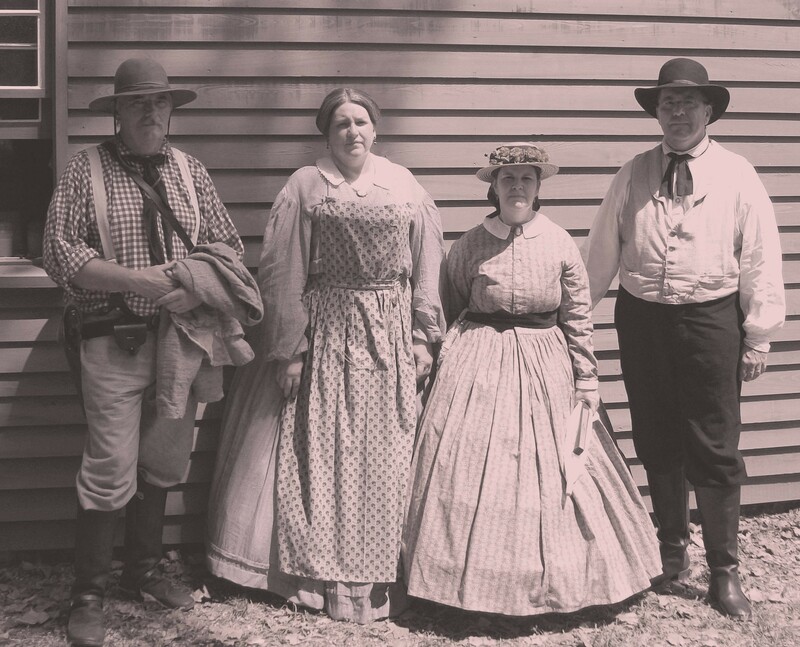 Mike Ochs (3rd L) and Terry Furgason (4th L) join 11th IN and skit of Morgan's Raid on Salem. 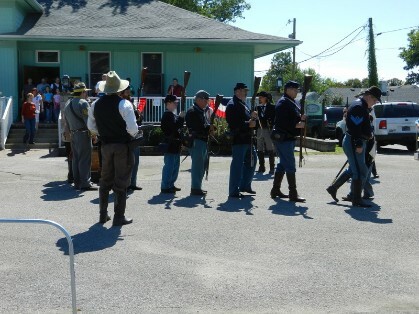 Ochs and Furgason and the 11th are captured soldiers during the festivities of Old Settlers' Days. Confederates also drill before morning battle. Mike Ochs (center) eats breakfast by the Greys' tent and the 11th IN encampment on Saturday morning. Terry Furgason, Rick Apsley, and Mike pose in front of tent after the battle. Near the sutler tents, Mike and Rick take break on the stage before going to supper.